Fairfield, Conn. – The Fairfield Emerging Leaders Organization (FELO), a young professionals group within the Fairfield Chamber of Commerce, is hosting its annual CEO presentation at the Fairfield Theatre Company (FTC), 70 Sanford Street, Fairfield, CT, on June 19th, 7:30am-9:00am. Two Roads Brewing Company was founded in 2012 by four friends (Brad Hittle, Phil Markowski, Clement Pellani and Peter Doering) who dreamed for years of starting a craft brewery. We foster a “road less traveled” philosophy in the beers we make and how we make them. In that spirit, Phil Markowski, our award-winning Brewmaster and 27 year craft beer veteran has created an extensive lineup that takes a unique twist on classic beer styles. Two Roads was named one of the ten best breweries in America by Paste Magazine and has won many awards including gold for Belgian Lambic style Ale in 2016 at the Great American Beer Festival. As highlighted on their website: Two Roads isn’t just the logo on our brewery building, it’s our philosophy. Life always seems to offer up two ways to go. It just so happens, we prefer the one less taken and having some fun along the way – in our lives, our careers and especially for our beers! Now our “road less traveled” philosophy is being brought to life in the beers that we create and how we create them. Brad’s own road in life took a detour on the road less traveled when after getting a college degree, he immediately decided that working on an offshore drilling ship in Southeast Asia would be a better way to launch into life. 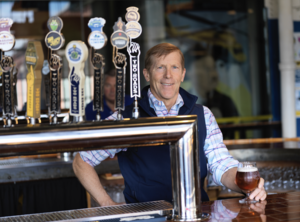 He later got his MBA degree at Kellogg and then spent time in the corporate world at Johnson & Johnson and Unilever— but he quickly learned that beer was a lot more fun and interesting. Brad’s career in beer most recently included being the Chief Marketing Officer at the Pabst Brewing Company until 2010, where he led the success of brands like PBR, Lone Star and Primo, among others. Prior to that, he worked on marketing for Rolling Rock. A dynamic and inspirational speaker, Brad delivers a riveting presentation about the pathway (which road? ), to success. One of FELO’s annual goals is to provide its membership with the opportunity of meeting a successful CEO … to listen to their story of achievement and accomplishment, while also gaining the knowledge and understanding of what it takes to be a successful leader. To attend, and for more information, please reserve your ticket for this very informative CEO speaker series event by calling the Fairfield Chamber of Commerce office: 203-255-1011 or register online at: www.FairfieldCTChamber.com. … FELO’s mission is to provide a platform for young professionals to engage in business-sponsored activities and connect with individuals to enhance professional leadership skills, while promoting social and civic opportunities for the enrichment of our business community, including volunteerism for non-profit organizations as well. With a focus on giving-back and also understanding the importance of education, proceeds raised through FELO events help provide funding towards the Chamber FELO Scholarship Program. Each year, FELO scholarships are awarded to two graduating high school students, either majoring in business or attending a business school. In only 4 years, FELO has awarded $10,000 in scholarships!